This performance was a wonderful surprise. 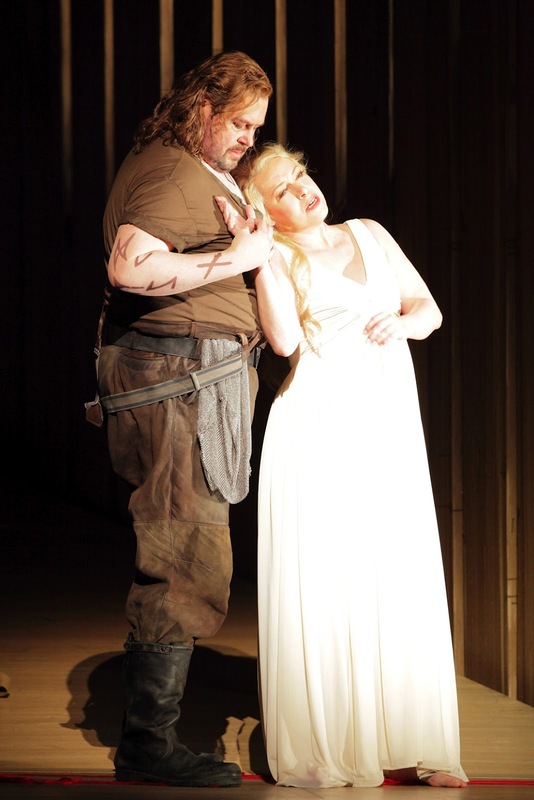 I went to see Nina Stemme’s Isolde, expecting not much more than the usual Festival mishmash out of the rest and worried about the prospects of Ben Heppner as Tristan. But we got a real, properly put together Tristan, and a damn good one at that. 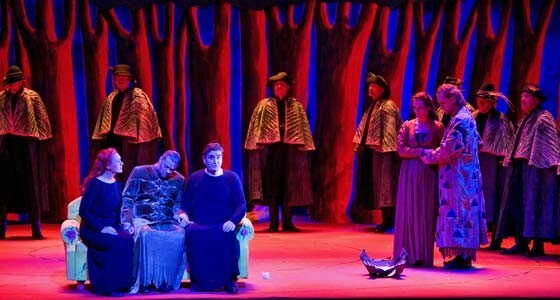 Wagner, Tristan und Isolde. Bayerische Staatsoper, 7/27/2011. 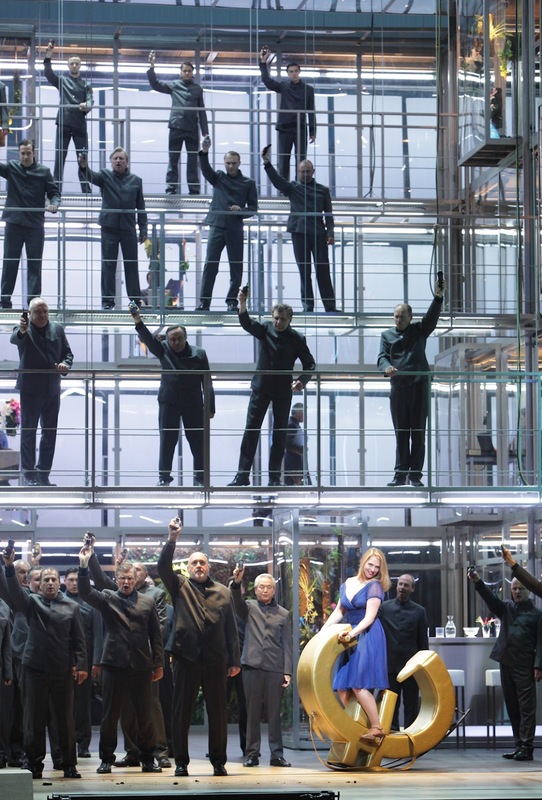 Production by Peter Konwitschny (revival), conducted by Kent Nagano with Nina Stemme (Isolde), Ben Heppner (Tristan), René Pape (König Marke), Ekaterina Gubanova (Brangäne), Alan Held (Kurwenal). Peter Konwitschny’s production presents an eclectic, ambiguous aesthetic. The costumes are a mix of modern and medieval garb while Act 1 takes place on a modern (or at least twentieth-century) ship, Act 2 in front of a painted fairy-tale backdrop and on a silly yellow floral couch, and Act 3 in a stark modern space with a slideshow of photos from happier times. But the larger point is crystal clear. 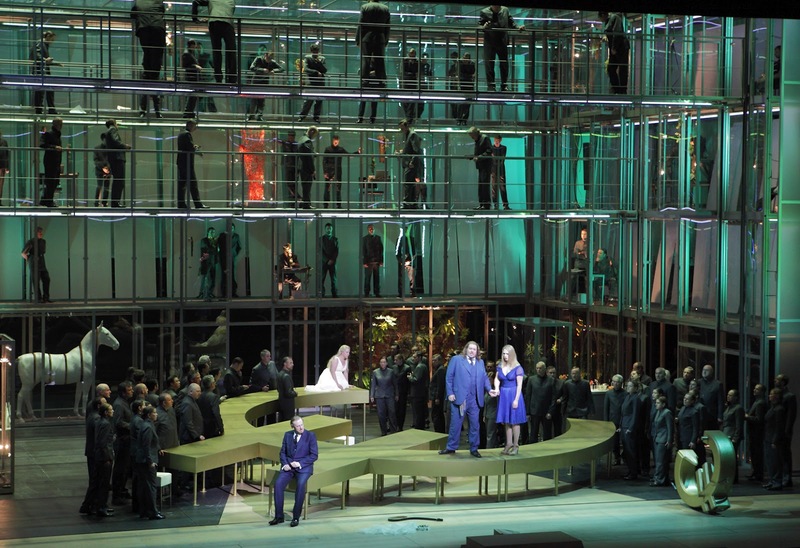 The upper, upstage part of the stage is the characters’ “reality” while Tristan and Isolde step forward, off this platform onto the apron of the stage to enter their own fantasy world. To illuminate their night in Act 2, visible Brechtian lights descend from above. The staging aims to be plausible and spontaneous and dramatic, downplaying the love potion and Marke’s wrath in favor of human empathy. It’s not that much to look at, but the thing is, it works, drawing you in at every moment. This is thanks to the greatest asset of any Konwitschny production, the meticulous Personenregie he coaxes out of his premiere casts. The movement traces the motion more of the music than the text, giving his work a wonderful fluid quality. These details often can’t be quickly reconstructed for revivals, and my expectations for this festival revival were low (it premiered in 1998). But from the start I noticed that there was something happening with the direction. Bless the Bayerische Staatsoper, they actually got Konwtischny to come and rehearse a bit with this cast (he even took a bow at the end), and you could tell. From Brangäne flipping the pages of a magazine as the sailor sang his song on, it was elegant and integrated with the score. 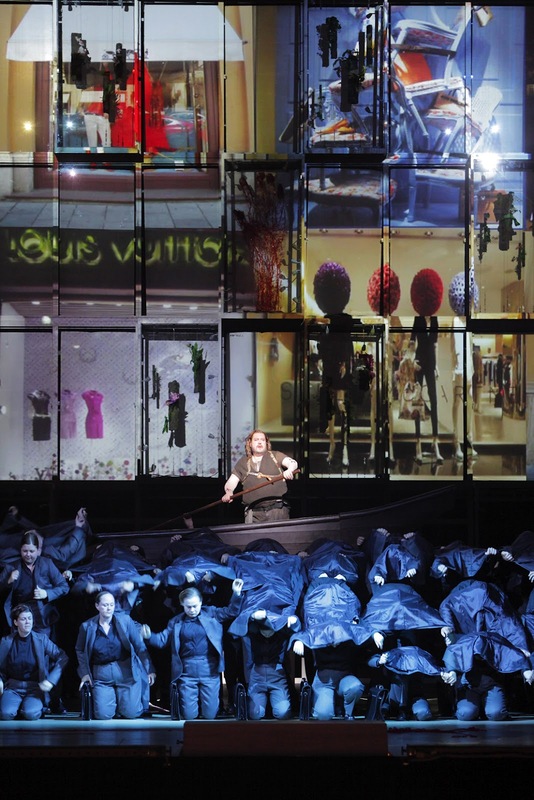 It was not as fearlessly physical as his Traviata, but this is Wagner singing. 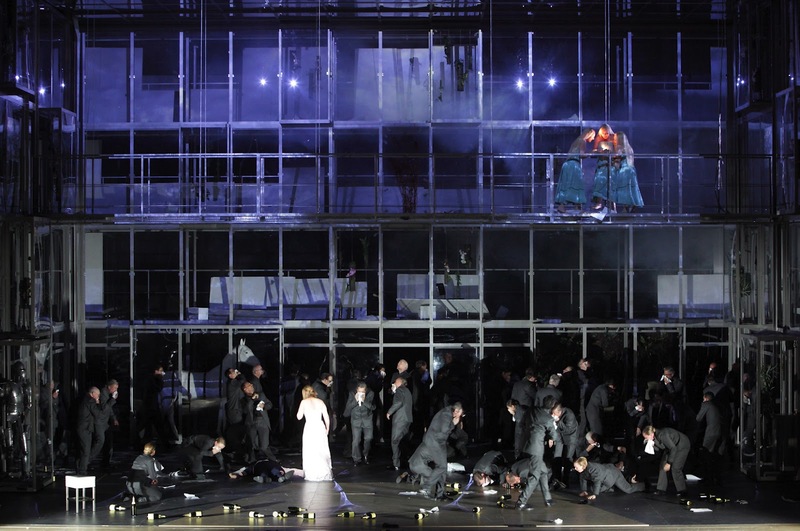 The staging’s most unusual moment is during the Liebestod, where Isolde steps to the front of the stage and is joined by a revived Tristan. They both wear black. While Isolde might die in the text, in the world of the music and night she lives united with Tristan, and that’s what we see. The image had been foreshadowed with two English horn players at the beginning of the act. Wordless musicians, they also exist beyond the confines of the upstage space. Kent Nagano conducted the excellent orchestra with restraint, clarity and controlled volume, a fine reading but a somewhat self-effacing one. The cast was about as all-star as it is possible to get. Nina Stemme is an astonishingly good Isolde. Her huge, dark voice is weighted towards the middle, but her high notes also cut through, she sings with an unwavering sense of the text and meaning of the music, and is an excellent actress. 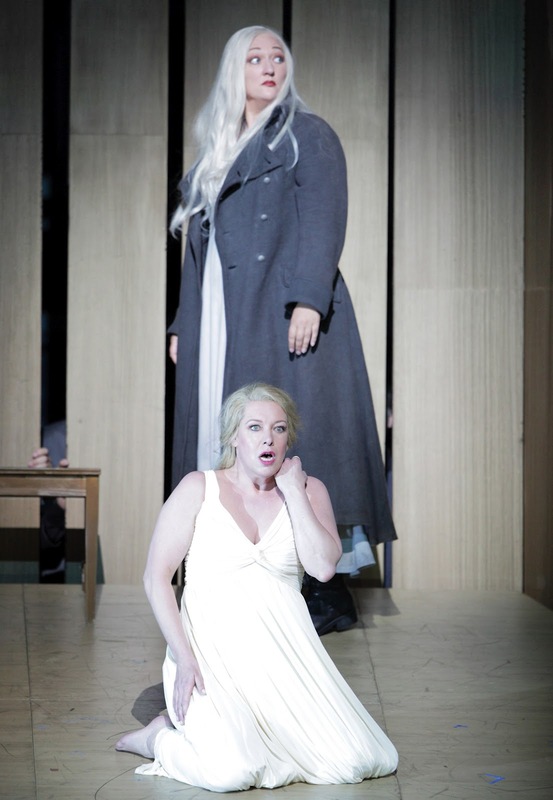 I doubt there is a better all-around Isolde today. Ben Heppner is surely past his best days of singing, but pulled together a credible performance. I wouldn’t call it the triumph that a few Tweeters seemed to hear–at a half dozen or so spots everything threatened to fall apart in gurgly cracks, and he somehow derailed a bit of the Act 2 duet (skipping a phrase, I think? ), making Stemme miss her next entrance. But he managed to recover each time and made it through to the end. That’s a higher compliment than it sounds like. The biggest applause of the evening actually went to René Pape’s generous, honey-toned König Marke, who due to the usual Nationaltheater sightline problems I couldn’t see at all but sang with the kind of resonant authority and majesty that threatens to steal the opera. 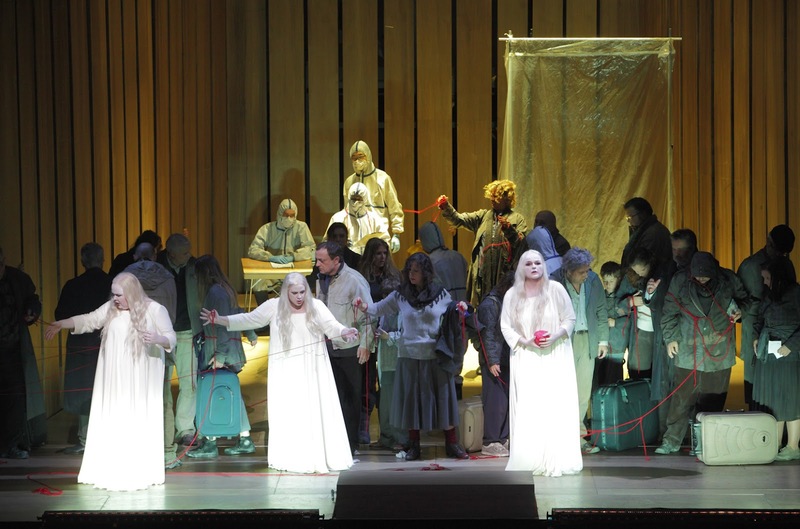 Ekaterina Gubanova as Brangäne got off to a muffled start but warmed up to be excellent if extremely Slavic in tone. Alan Held was a very good Kurwenal as well. A class act, all around. This production is available on DVD with a different cast. Strauss-Hofmannsthal, Ariadne auf Naxos. Metropolitan Opera, 2/4/2010. 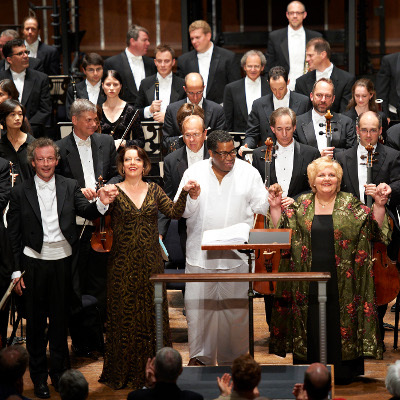 Conducted by Kirill Petrenko with Nina Stemme (Ariadne), Kathleen Kim (Zerbinetta), Sarah Connolly (Komponist), Michael Hendrick (Bacchus). Directed by Laurie Feldman, after a production by Elijah Moshinsky. As you can probably guess, in the whole Ariadne v. Zerbinetta stakes of this opera, I’m usually on the side of the trilling, coloratura’d one. But last night was not usual. 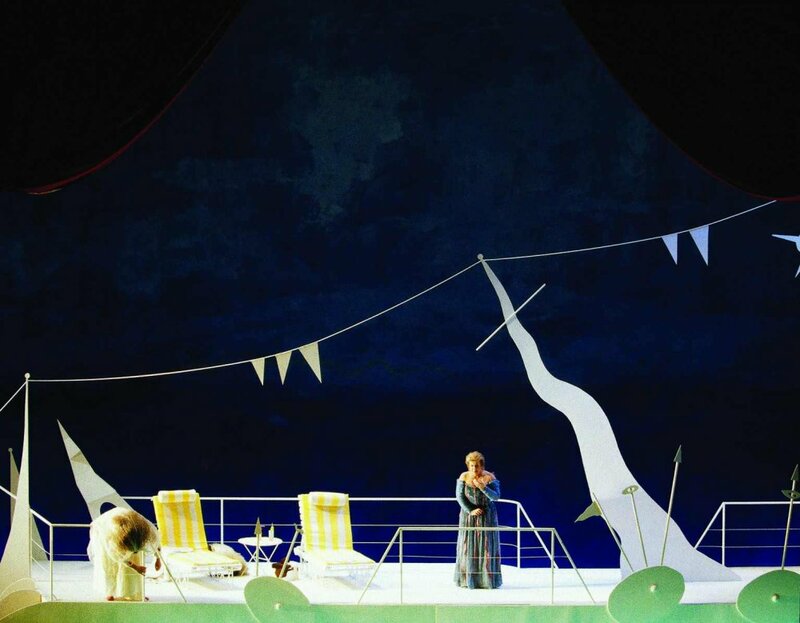 Nina Stemme as Ariadne was the only singer in this cast who makes things more than routine. More than that, she is FANTASTIC. New fan here. The Vorspiel was disappointing. The production is overstuffed with Merry Antics from Zerbinetta’s troupe, the stage cluttered. Nothing zoomed or zinged or zipped, it just sort of ambled. The orchestra seemed asleep at their scores. (Though I think the chamber scoring of the whole score is a bad fit for the Met’s size, and I suspect a lot of detail was lost.) Sarah Connolly’s Komponist was respectably and musically sung but without vocal breadth or glamour. Jochem Schmeckenbecher a well-sung but dully characterized Music Teacher. I enjoyed Kathleen Kim’s Olympia in Hoffmann last December very much, but as Zebinetta she didn’t offer Stemme much competition in the vocal compare-and-contrast. She’s cute and has a sweet voice, but not nearly the magnitude of personality or variety of expressive colors to make Zerbinetta more than a caricature. 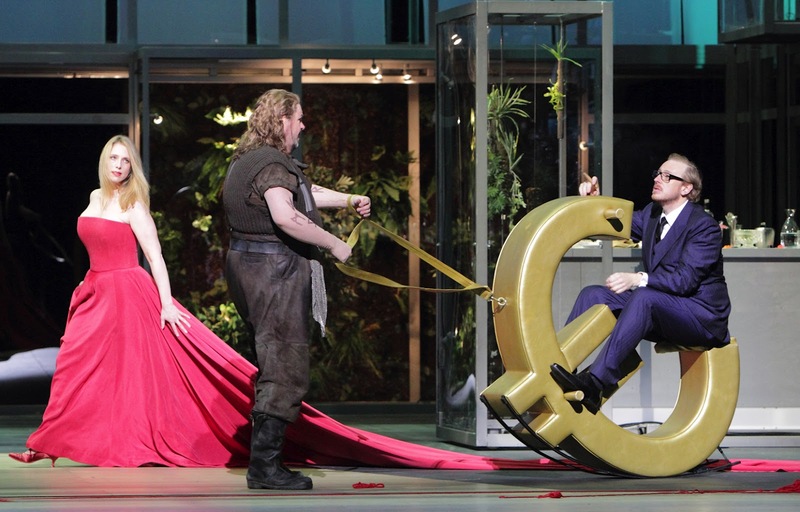 Compared to Stemme’s march through rage, vulnerability, excitement, and more rage, she was just bubbly. She’s in the songbird mode, and while Zerbinetta’s aria demands chirping it also requires a much wider emotional range, and quicker changes between moods. The more lyrical parts of the role had little impact, particularly the Vorspiel duet with the Komponist. There was some fudging in the last section of the big aria, and her trill isn’t particularly good, but it’s a marathon. Tenor Lance Ryan was out sick, and unfortunately cover Michael Hendrick was sick too, but bravely went on. Poor guy, it wasn’t the most pleasant experience for anyone concerned, but he sounds like he has a good voice, and I hope to hear him under more favorable circumstances at some point. The Rhinemaidens, I mean the nymphs, by the way, were beautifully sung, particularly Tamara Mumford’s Dryade. This production has them rolling around on these high dress things, and the ladies have to emote solely with their elbows. But prettily done. Zerbinetta’s backup singers were unobjectionable, if occasionally inaudible. I could have done with less mugging but I guess that’s the production’s fault. I wasn’t sure if all the comic stuff was really supposed to be funny (which it wasn’t, but this business is hard to pull off) or intentionally dumb and annoying, in which case it wasn’t ridiculous enough. I think the intentionally dumb angle belongs to another production, one with a more radical perspective on the piece. 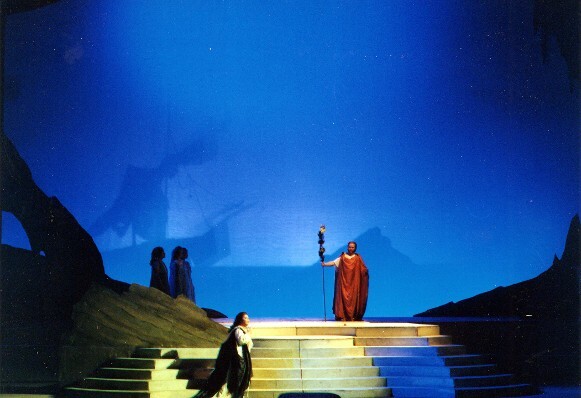 The production, originally by Moshinsky, is traditional in the prologue and a little more fanciful in the opera. It involves many of those sliding panels we know and hate from Bartlett Sher’s Met productions. 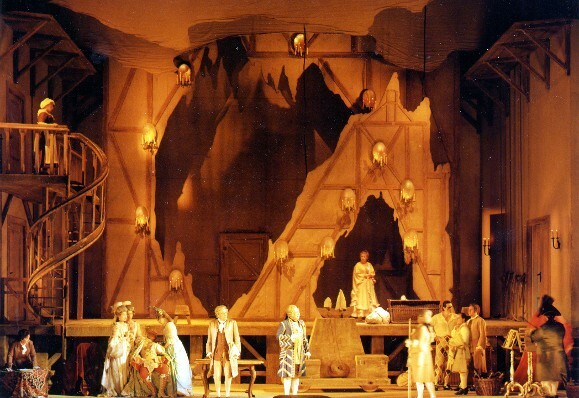 And who should the set designer be but Michael Yeargan, who designed Sher’s Barbiere and Hoffmann as well (he also designed the current Don Giovanni, which probably featured sliding panels but I’ve blocked that particular night at the Met from my memory). Oh well, the panels slide endlessly to no clear end but the final tableau with Bacchus is nice, and the colors are beautiful (an attractive color scheme in a Met production! what a concept!). Confession: once I got the measure of things, secretly I was hoping for the other Ariadne, the one in which it rains, the fireworks are canceled, and the two shows are performed separately. Then I could leave before Zerbinetta and her team came out. But I landed in the wrong timeline where the plane DOES crash and got the usual crazy smashed-together one. No Desmond in my timeline, very disappointing. Also, aren’t we all glad Lost is back? Three cheers for surreal desert islands. Next! : I’m not sure! The Met is quiet this month. I may write about The Bridge Company’s Tempest shortly! Otherwise, Attila! Do you know Pierre Audi? If you do, you will know why I am very intrigued to see this! 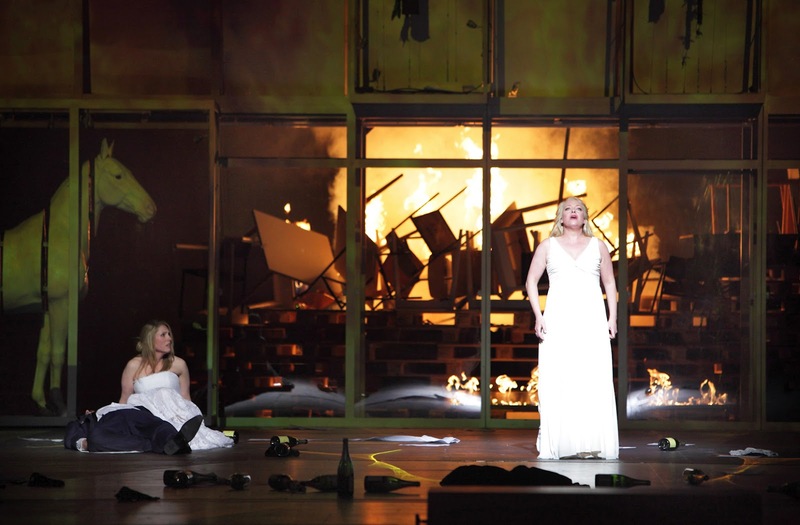 *However, I didn’t like how the production has Ariadne drop back into the persona of the Prima Donna from the Prologue when Zerbinetta first enters. The Opera is something much more interesting than just an extrapolation of the Prologue’s events, and going back into the Prologue mode breaks the mood.